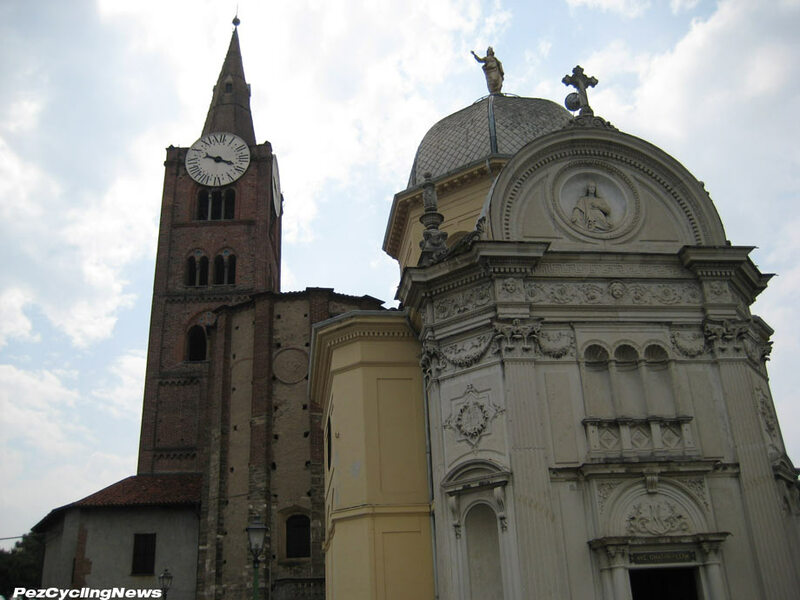 Stage Preview: Stage 18 from Muggio to Pinerolo features two very tough little climbs right at the end - the Par'Martino, and the San Maurizio. I rode these when the Giro finished here in 2009. The difference this time is they're being taken in reverse, turning what was a tough climb followed a very dangerous descent into an even tougher climb with a still challenging drop through narrow, twisty wooded roads, and a 20% kicker to finish it off. 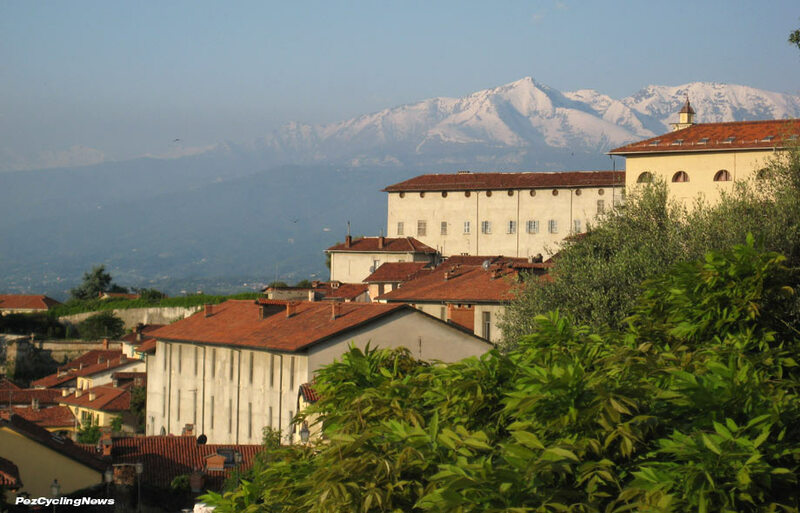 Here's the view from Pinerolo west to the Alps. 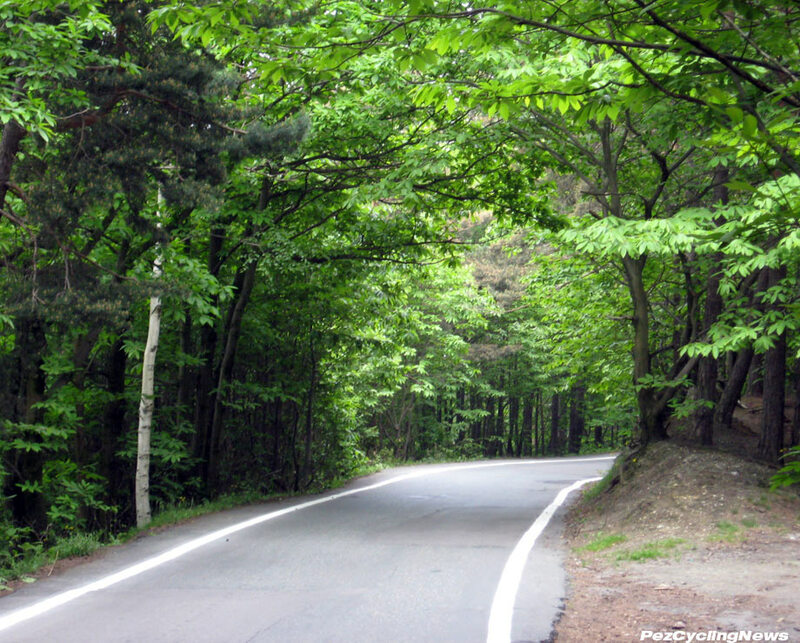 It’s about 5km to the top – on small single lane roads that twist a turn through a wooded forest. 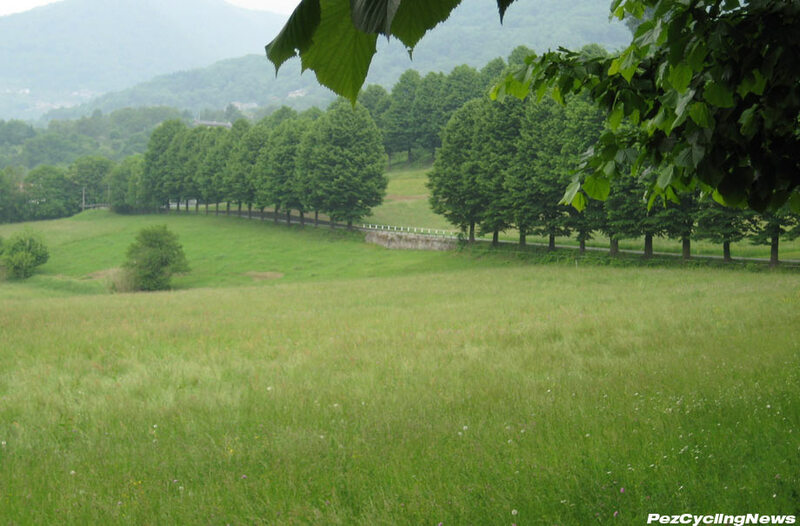 If it’s sunny – it’ll be hot and humid inside because the heavy woods will stifle any breeze. If it’s wet – the roads will be slippery from leaves and whatever other junk hasn’t been swept up by the local cleaning crew. There’s nary a section of road the entire climb that’s straight for more than 50 meters – anyone who escapes has the advantage of getting out of sight quickly. The slope runs at 10% average, with a max of 17%, that should see the bunch split apart like the transmission in an old Fiat. 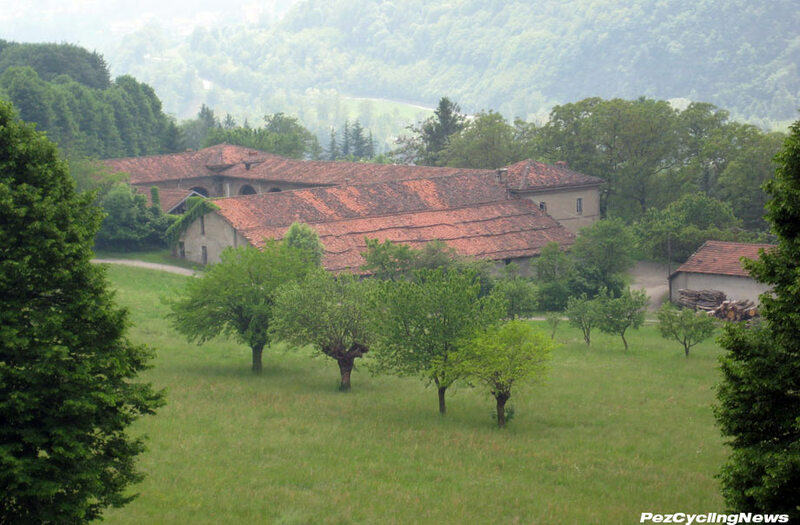 It's a perfect launchpad for a decisive move from anyone who favors tough short, punchy climbs - like Valverde. That’s the first part of the story – the second is the descent – 10km of twisty turny, very technical 6-7% grade nastiness – off-camber turns, no guard rails, unprotected concrete abutments – in a word: “yikes”. It’s perfect to get away if you’ve got the scrotes, plenty dangerous if you don’t. 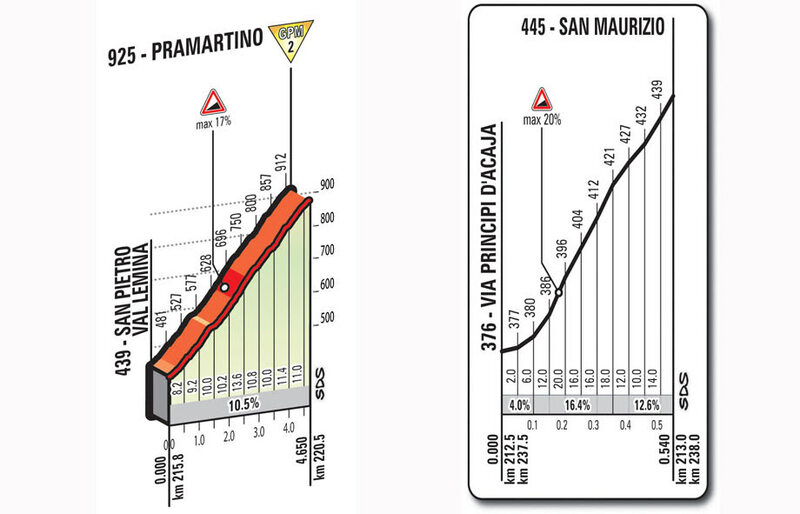 Passing will be tricky and the gaps at the top could easily be larger by the bottom - Nibali should like this one. There’s one more small climb about 2.5km from the line – up the Via Prinicipi d'Acaja that's only 500 meters long, but reaches 20% at it's steepest. This will be a nice little stinger and open more launch pad for last minute glory. Pez Roadside Stage 19, 2009: It’s rest day 1 for the racers of this Giro, but not for me - I’m in Pinerolo, and took a ride on the final climb of tomorrow’s epic stage from Cuneo… the 925m Pra Martino – and it will be decisive. 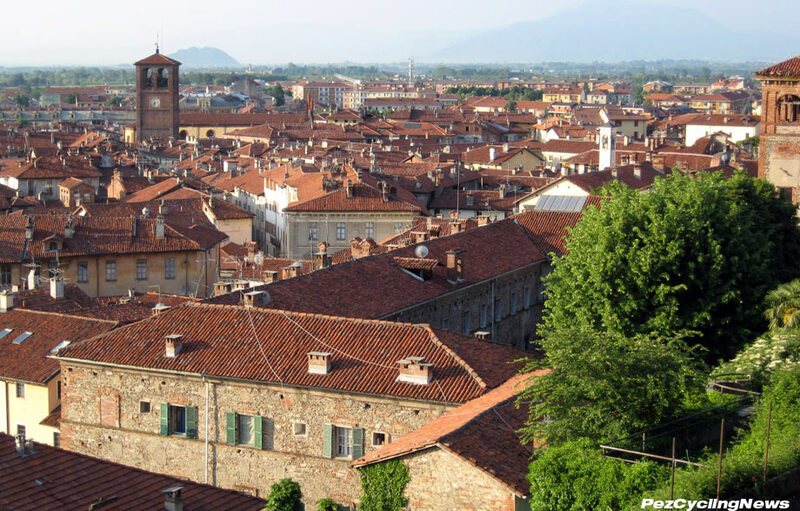 The red tiled rooftops of Pinerolo. Pinerolo lies between Torino and Sestriere, and after a morning transfer down from Milan, by 1130 I was checking into my room. The plan was a good one – even if it was plan B. My original hopes to ride the Colle del’Agnello & Izoard were dashed by both passes still being snowed under. 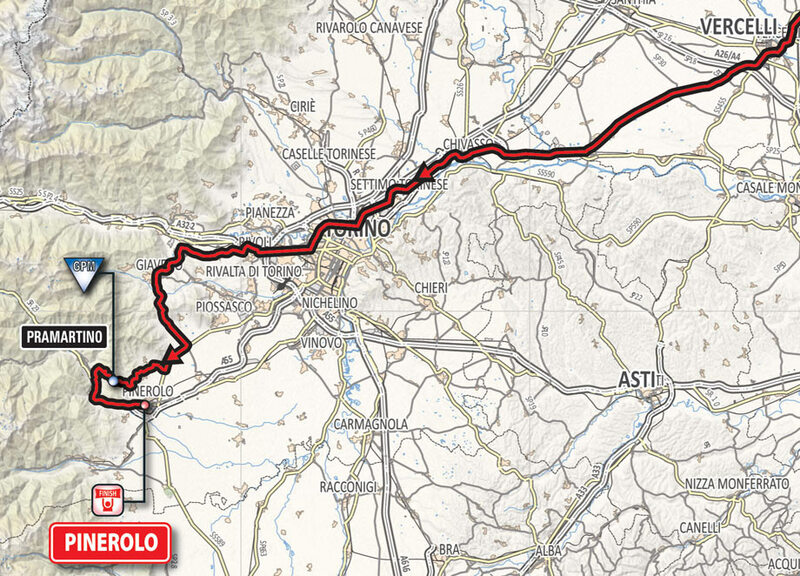 And even though the official Giro route had been changed a few weeks back to miss these famous climbs, the new route of 262km offered up some tough challenges – but I saw today they are not with out some danger. Ride…. 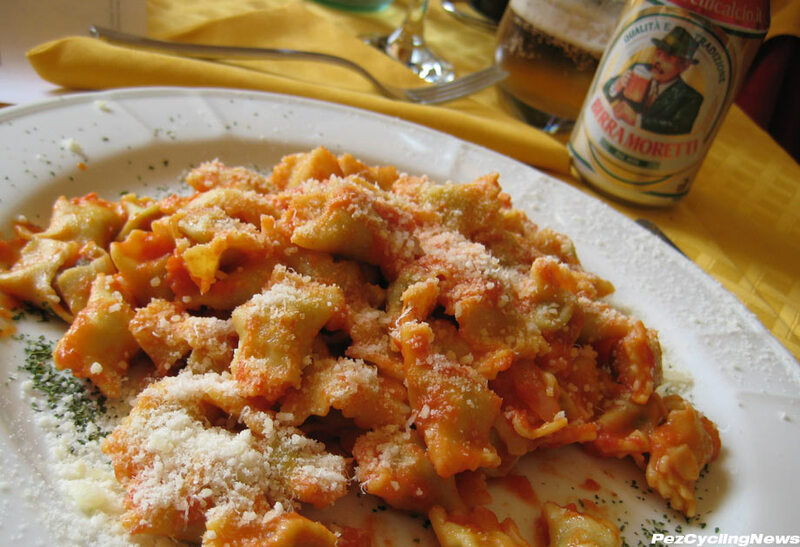 Nap… ride… nap… It’s such a fine line after a pre-ride lunch of delicious agnulotti. 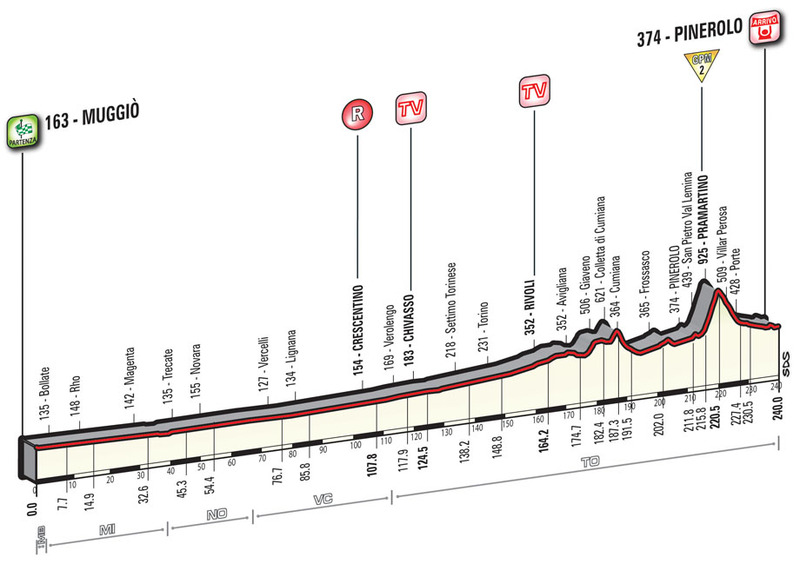 The 2016 Giro d'Italia's stage 18 stage will be be an easy day for viewers – because all the action will happen in the final 20km – guaranteed. 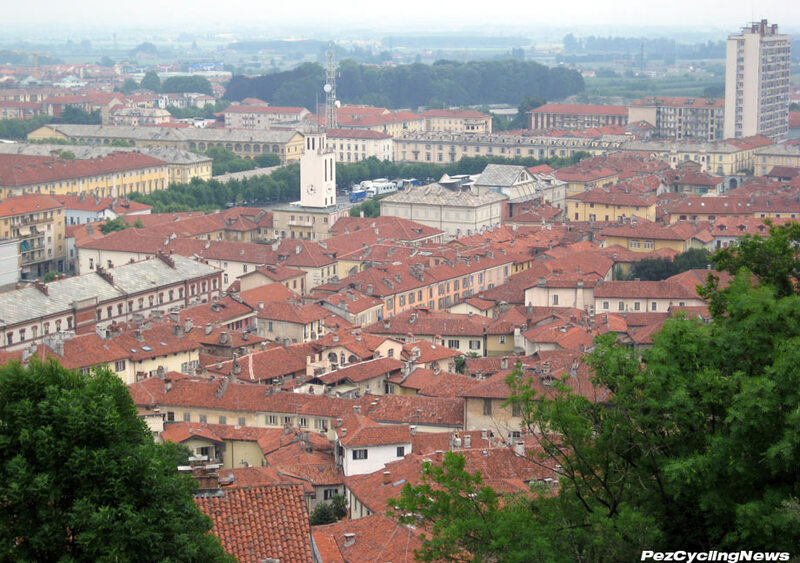 Most of the stage will be flat, dull, and possibly a challenge to maintaining concentration as it traverses a rather sightless part of Italy. But see that little blip at the end of the stage profile? That little biter comes after 211 of racing and is going to cause some pain - so be prepared for some racing. 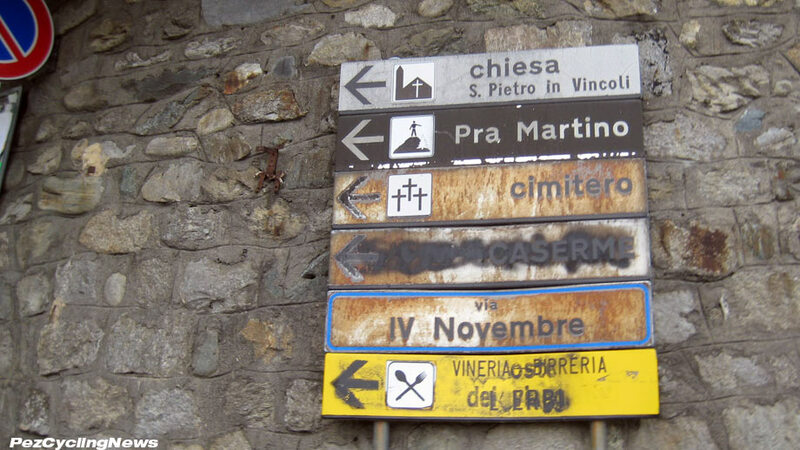 Gentlemen, and ladies… may I present the climb to Pra Martino. The town disappears after the first ramp, and around the second corner you’re greeted with an imposing grade of 8%, with no escape behind these column-like trees, which carry on for some distance. 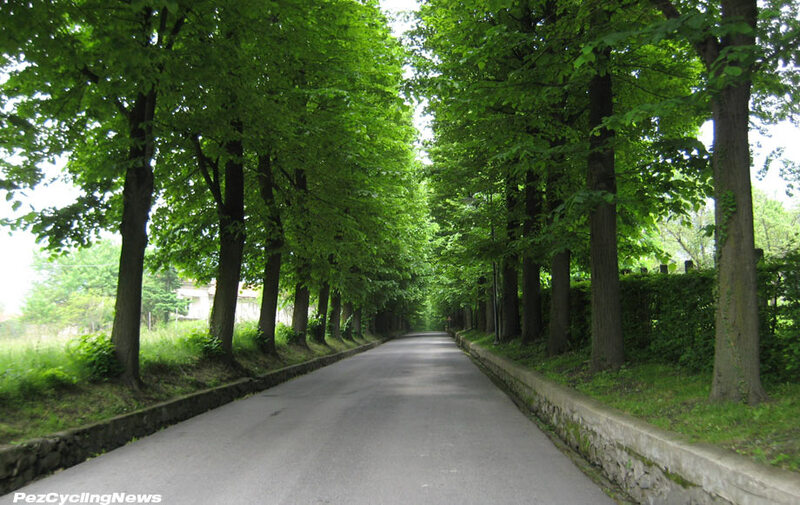 Follow the line of trees and you’ll be safe. 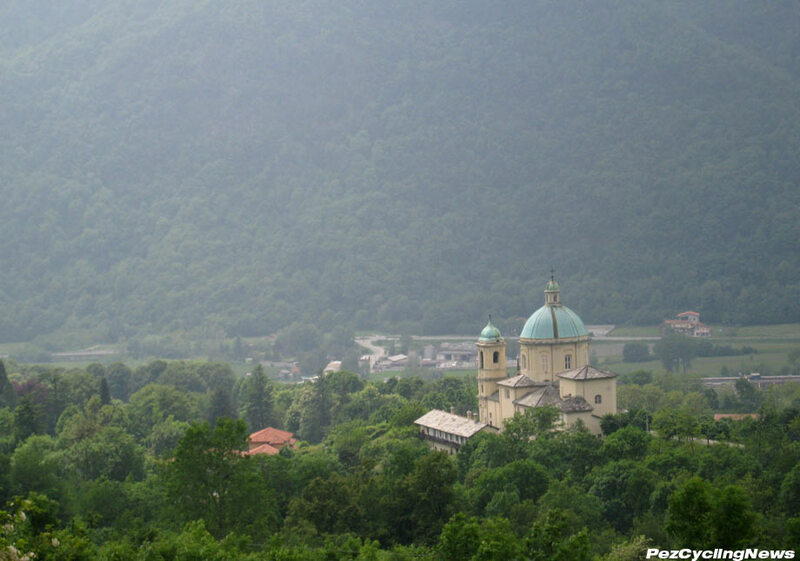 The Chiesa di San Pietro sits majestically at the top of ramp #5, and enjoys a commanding view of the valley below. 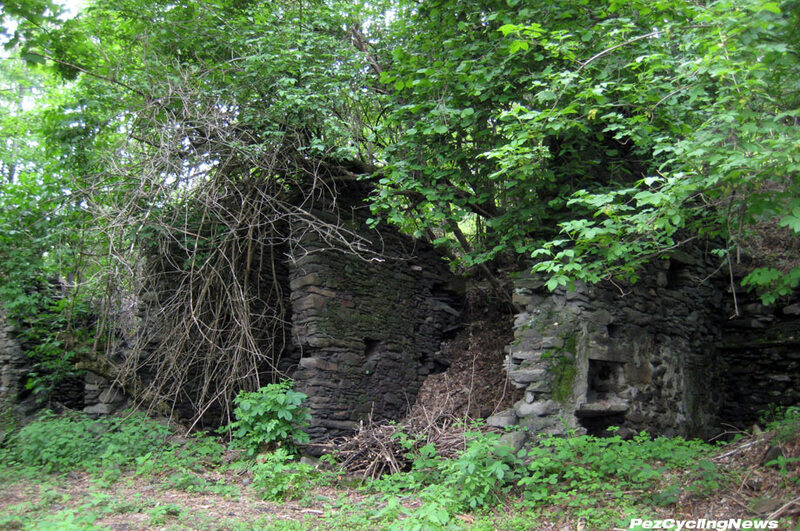 My second sign that this climb has been left in disrepair is the number of crumbling stone buildings along its path – including that entire farm/ barn down below. Somewhere in the middle section I caught these two guys – both in their 50’s, and chatting up a storm. I coughed out a “ciao” as I rode past, and they were barely out of breath. 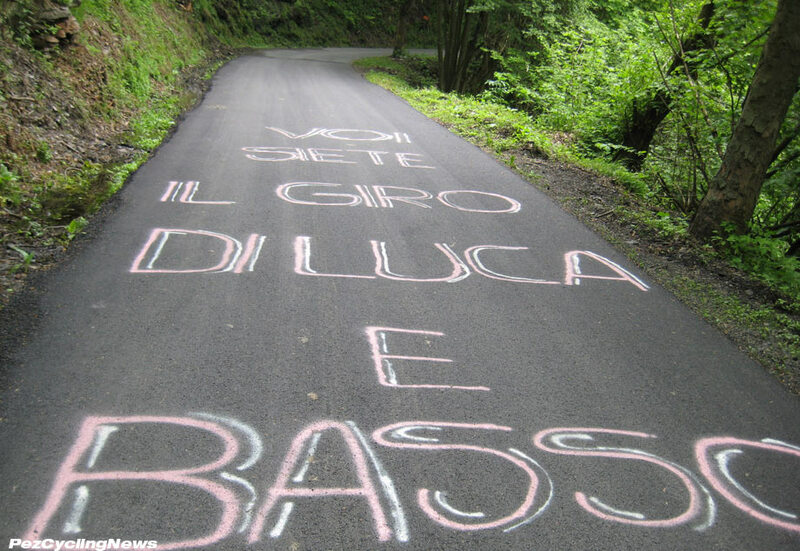 … back in the day (2009), there were A LOT of Basso fans here… and at least one for Di Luca. The summit is unceremonious and unwelcoming… with just another gutted building, although this one from more modern times. There’s also a cordoned off launch pad for hang gliders and a transmission tower. The descent hastens riders away to the left. 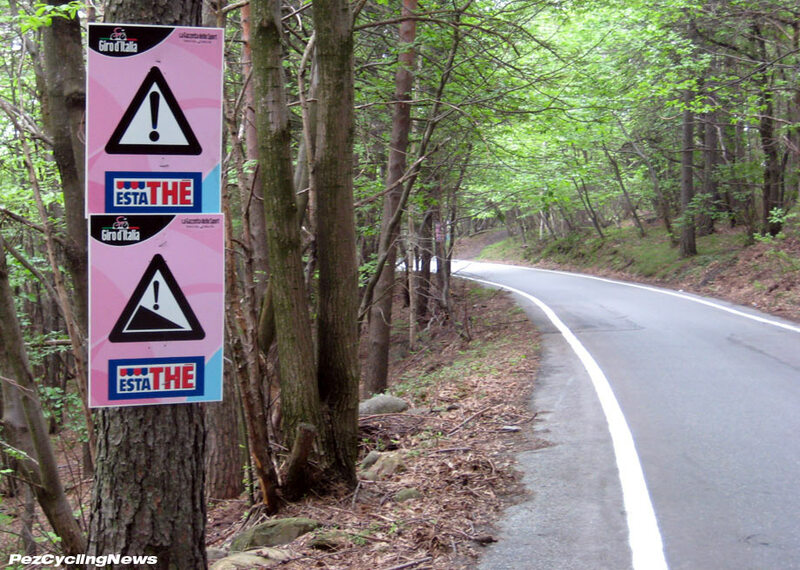 In 2009 there was a outcry from riders about unsafe courses at the Giro, resulting in a peloton-wide protest at the previous day's stage in Milan, which led to a 6 hour coffee ride around a circuit that was strewn with trolley tracks and other dangerous surfaces. 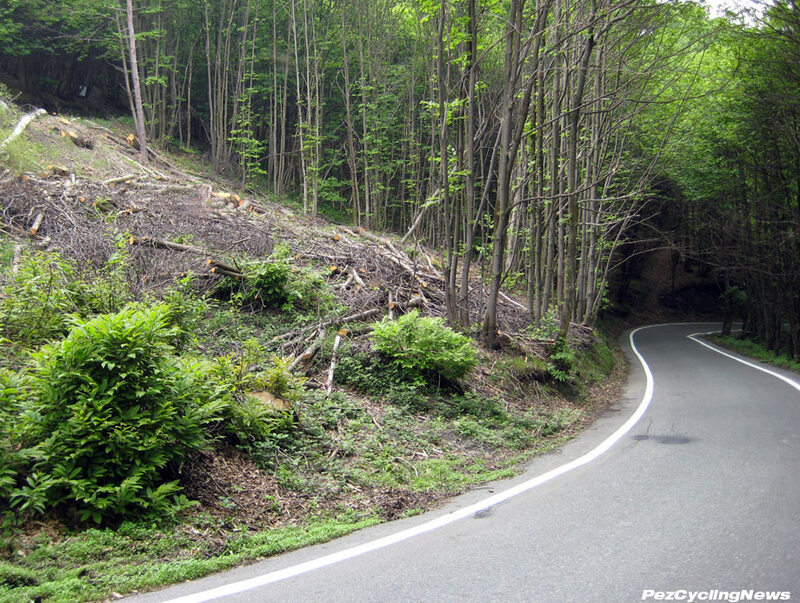 The roads here were marked with fresh white paint, this switchback (below) was the only one that was clearcut so riders could better see the turn. There’s no question for me that the drop here is unsafe at race speeds. It’s very steep and very technical. 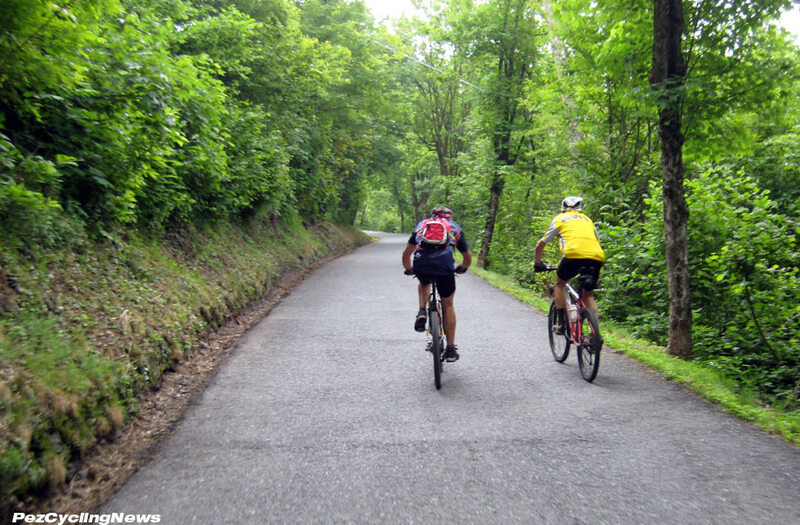 The average grade is listed at 10% in the guida, with countless switchbacks, connected by bumpy off camber sections. It’s honestly more a test of nerve & two-fisted braking skills than how fast you can carve a turn. 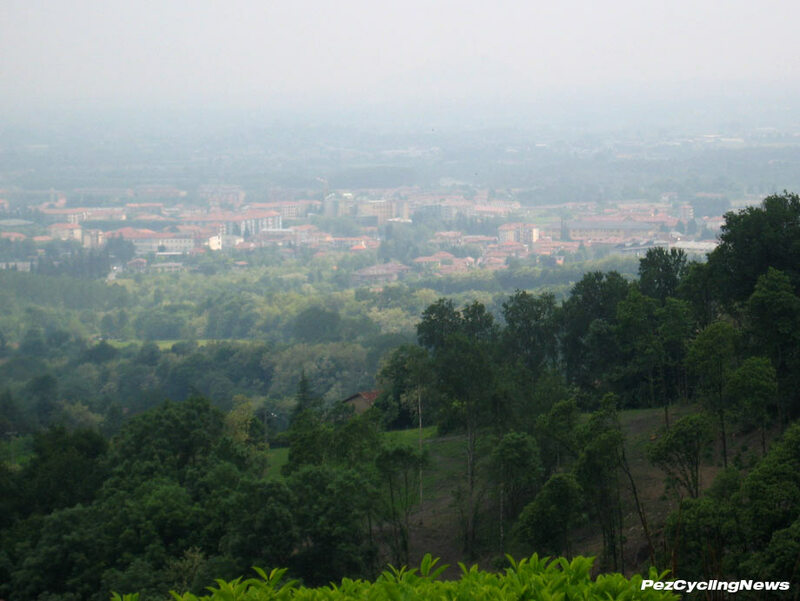 There’s Pinerolo again… not far now. 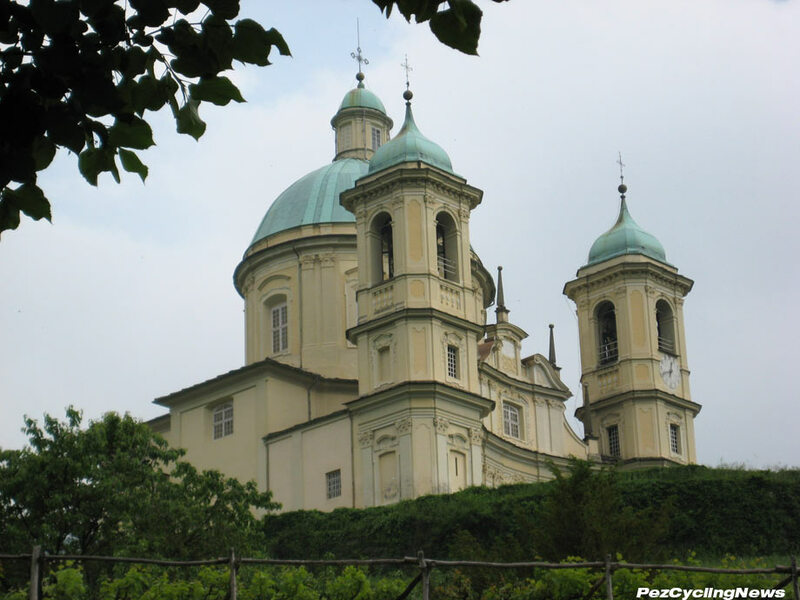 Not far to the base of the descent, here’s yet another church – let’s hope someone says a prayer for the riders. 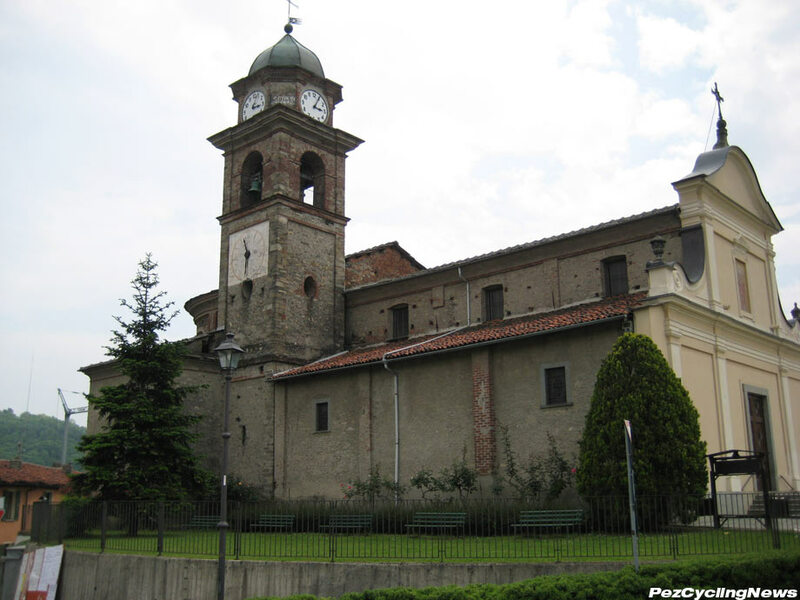 Once off the descent, it’s a 1600m flat run to Pinerolo, and a hard left hander that delivers the corsa to one final uphill section – a few hundred meter climb to the Basilica di San Maurizio (above). It’s just enough to charge the legs with one more dose of lactic acid, then another fast drop to the town center and it’s narrow, cobbled streets. And here I am – 10km later, back at my hotel, perched conveniently on the corsa.